"Apostolate is the flower of true love of God and of souls: it is the fruit of an intense interior life. It requires a burning heart which is unable to contain or suppress its interior fire. The apostolate makes us God's loudspeakers." Apostolate is essential for the members of the Institute. "It has to be an apostolate faithfully exercised not merely in the world but with worldly means, using one's profession, activity, talents, workplaces and circumstances corresponding to secular conditions...and it also calls for new and daring efforts although always in the spirit of the Church and according to her norms" and in any case keeping particularly in mind the use of technical methods and organizations for apostolic ends. Because by a particular gift of God the members are associated to The Society of St. Paul, members must never forget that their apostolate is true preaching, that is, "a saving action because it produces faith." But members must know that the first and foremost apostolate is their "witness." We live a life according to the Gospel. Our lives are transormed into living in the spirit of St. Paul "I live now not I, but Christ lives in me. "(Gal 2:20) Our lives must be a "silent sermon"
to the Gospel of Jesus Christ. We have the apostolate of Prayer. Prayer, so the Gospel and the love of Jesus may spread throughout the entire world so it will bring about the salvation of souls. Prayer is the soul of our apostolate of Social Communication. Apostolate can be carried out in parishes however possible. It could be to set up distribution centers for media materials such as books, cd's of music and film, and other media information material to help spread the Gospel. We can also be called to begin to set up radio, television, and internet media. Members can also bring to notice to others those radio, television, films and internet programs which help people spiritually, and also which ones that should be avoided. Members should also celebrate the annual World Day of Social Communications, by inviting people to pray for the good use of Social Communications for the spread of the Gospel. In every possible way the members should promote the distribution of Sacred Scripture, "the mirror in which the pilgrim Church on earth contemplates God." Members should promote, participation at Mass, study of the Catechism, and reciting the Rosary. 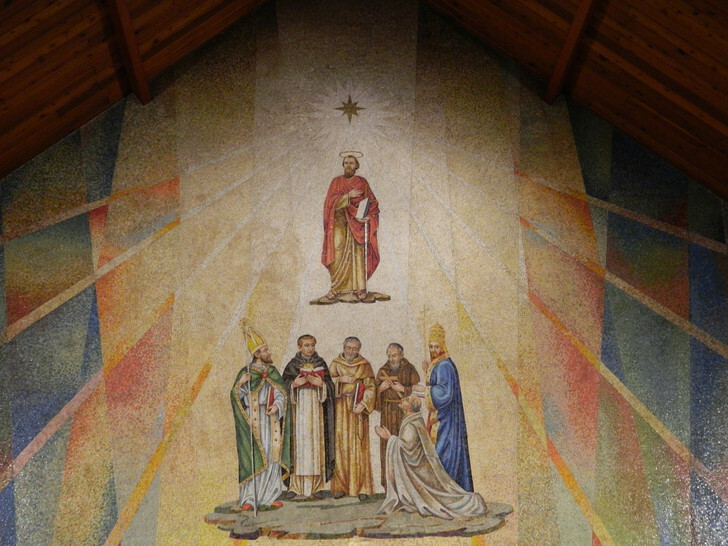 The Pauline Family who was "Born of the Host" has devotion to Eucharistic Adoration, which is "the heart of life and of apostolate, the sacrament of love, the sign of unity and the bond of charity." So, members are to promote Eucharistic Adoration. Members are also to pray and work for vocations. "Giving vocations to the Church means that we really love her." If the member is near to other Congregations within the Pauline Family the member may offer to help the other Congregations wherever possible through their talents and time. While carrying out the apostolate members must carefully keep in mind the directives, spirit, and methods of the Pauline Family whose purpose is "the salvation of souls." St. Augustine, St. Thomas Aquinas, St. Alphonsus Liguori, St. Bonaventure, St. Gregory the Great and kneeling Pope Leo XIII.